Source water protection is a first line of defence. This is best done through collaboration since no single agency has the exclusive responsibility for keeping the watershed healthy. This is where the SWC comes in: as a partnership of several organizations with different roles in water, it facilitates different groups working together to protect and enhance water quality. Taking steps to protect Shuswap water resources is an important investment in the future of the region. It is easier and less costly to manage small programs now, while water quality is generally good, than to try to fix more serious problems later. The SWC implemented its Water Quality Program in 2016, with financial support from the CSRD, TNRD, and City of Salmon Arm. 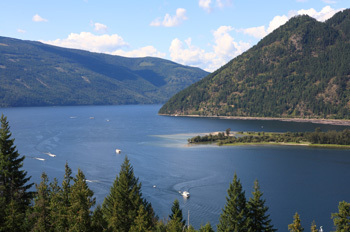 In 2018, Adams Lake Indian Band became a financial supporter of the SWC’s work. Improving public access to the provincial water quality database (this project is now complete – see our database user guide). Dialogue with leaders in the agricultural sector to find out what education, incentives and support will work best in the sector. See the full five-year program plan here: Water Quality Program and Recreational Safety Education Program in the Shuswap Watershed (2016 – 2020). Get up-to-date information about the water quality at beaches – including some popular ones in the Shuswap – using the Swim Guide app. The app is free and easy to use, and will provide you with recreational water quality for 7000 beaches and swimming sites in Canada, the US, Mexico and New Zealand. Everyone in the Shuswap can help protect water quality. This is so whether you are a farmer choosing fertilizers, a houseboat operator managing greywater, or an individual homeowner looking to lighten your footprint. Keep existing septic systems in good repair. The CSRD's SepticSmart Guide is a good place to start. Properly dispose of medications. Check out this helpful resource. Also check out the SWC Water Protection Initiative brochure. Have you heard ... I Don't Flush! Pledge not to flush personal care products, such as floss, swabs and wipes, to help keep water quality and sanitary sewers in shipshape. 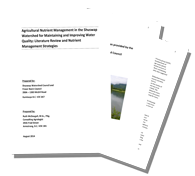 A new report on nutrient management in the Shuswap is now available: see Agricultural Nutrient Management in the Shuswap Watershed for Maintaining and Improving Water Quality. The report canvasses current research and management practices for reducing phosphorus loading on agricultural land and for reducing the movement of phosphorus from agricultural land into surface water. It sets opportunities for further research, education and dialogue, and strategies to improve phosphorus management. The Shuswap Watershed Council commissioned the report to assist in the development of its five-year program.